Inherited by BotServCore, BSAssign, BSAutoAssign, BSBadwords, BSBot, BSBotList, BSControl, BSInfo, BSKick, BSSet, ChanServCore, CSAccess, CSAKick, CSBan, CSClone, CSDrop, CSEnforce, CSEntryMessage, CSFlags, CSGetKey, CSInfo, CSInvite, CSKick, CSList, CSLog, CSMode, CSRegister, CSSeen, CSSet, CSSetMisc, CSStats, CSStatus, CSSuspend, CSSync, CSTop, CSTopic, CSUnban, CSUpDown, CSXOP, DatabaseRedis, DBFlatFile, DBMySQL, DBOld, DBSQL, EBCRYPT, EMD5, ENone, EOld, ESHA1, ESHA256, Fantasy, GLGlobal, GlobalCore, GnuTLSModule, Greet, Help, HelpChannel, HostServCore, HSDel, HSGroup, HSList, HSOff, HSOn, HSRequest, HSSet, HTTPD, IRC2SQL, LDAPOper, MChanstats, MemoServCore, ModuleDNS, ModuleDNS, ModuleDNSBL, ModuleLDAP, ModuleProxyScan, ModuleRedis, ModuleRegexPCRE, ModuleRegexPOSIX, ModuleRegexTRE, ModuleRewrite, ModuleSASL, ModuleSASLDHAES, ModuleSASLDHBS, ModuleSQL, ModuleSQLAuthentication, ModuleSQLite, ModuleSQLOper, ModuleWebCPanel, ModuleXMLRPC, ModuleXMLRPCMain, MSCancel, MSCheck, MSDel, MSIgnore, MSInfo, MSList, MSRead, MSRSend, MSSend, MSSendAll, MSSet, MSStaff, NickServCore, NSAccess, NSAJoin, NSAList, NSCert, NSDrop, NSGetEMail, NSGetPass, NSGroup, NSIdentify, NSIdentifyLDAP, NSInfo, NSList, NSLogout, NSMaxEmail, NSRecover, NSRegister, NSResetPass, NSSet, NSSetMisc, NSStatus, NSSuspend, NSUpdate, OperServCore, OSAKill, OSChanKill, OSConfig, OSDefcon, OSForbid, OSIgnore, OSInfo, OSJupe, OSKick, OSKill, OSList, OSLogin, OSLogSearch, OSMode, OSModInfo, OSModule, OSNews, OSNOOP, OSOLine, OSOper, OSReload, OSSession, OSSet, OSShutdown, OSStats, OSSVS, OSSXLine, OSUpdate, ProtoBahamut, ProtoCharybdis, ProtoHybrid, ProtoInspIRCd12, ProtoInspIRCd20, ProtongIRCd, ProtoPlexus, ProtoRatbox, ProtoUnreal, SQLLog, SSLModule, and StatusUpdate. Every module in Anope is actually a class. Definition at line 214 of file modules.h. Creates and initialises a new module. loadernick The nickname of the user loading the module. Definition at line 19 of file module.cpp. 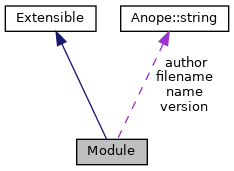 References Anope::string::c_str(), created, Anope::CurTime, Language::Domains, ModuleManager::FindModule(), sepstream::GetToken(), handle, Anope::IsFile(), Language::Languages, Anope::LastError(), Anope::LocaleDir, ModuleManager::Modules, name, Anope::NoThird, permanent, SetAuthor(), SetVersion(), THIRD, type, VENDOR, and Anope::Version(). Destroys a module, freeing resources it has allocated. Definition at line 65 of file module.cpp. References TimerManager::DeleteTimersFor(), ModuleManager::DetachAll(), Language::Domains, ModuleManager::Modules, IdentifyRequest::ModuleUnload(), and name. Retrieves whether or not a given module is permanent. true if the module is permanent, false else. Definition at line 89 of file module.cpp. Referenced by CommandOSModReLoad::Execute(), and CommandOSModUnLoad::Execute(). Definition at line 620 of file misc.cpp. Definition at line 563 of file modules.h. Definition at line 612 of file modules.h. Definition at line 618 of file modules.h. Definition at line 605 of file modules.h. Definition at line 550 of file modules.h. Definition at line 675 of file modules.h. Definition at line 682 of file modules.h. Definition at line 422 of file modules.h. Definition at line 428 of file modules.h. Definition at line 324 of file modules.h. Definition at line 416 of file modules.h. Definition at line 593 of file modules.h. Definition at line 588 of file modules.h. Reimplemented in MemoServCore, and ChanServCore. Definition at line 598 of file modules.h. Definition at line 400 of file modules.h. Called when a user uses botserv/info on a bot or channel. Reimplemented in BSKick, BSAssign, Greet, and Fantasy. Definition at line 825 of file modules.h. Definition at line 442 of file modules.h. Definition at line 409 of file modules.h. Definition at line 977 of file modules.h. Reimplemented in OSIgnore, OperServCore, and ChanServCore. Definition at line 970 of file modules.h. Called before a bot is unassigned from a channel. EVENT_CONTINUE to let other modules decide, EVENT_STOP to deny the unassign. Definition at line 331 of file modules.h. Definition at line 1063 of file modules.h. Definition at line 632 of file modules.h. Definition at line 490 of file modules.h. Reimplemented in MChanstats, and NickServCore. Definition at line 779 of file modules.h. Reimplemented in CSSet, CSMode, MChanstats, ChanServCore, OSInfo, CSList, CSTopic, CSSuspend, and CSSetMisc. Definition at line 700 of file modules.h. Called when a new channel is created Note that this channel may not be introduced to the uplink at this point. Reimplemented in CSSet, and IRC2SQL. Definition at line 663 of file modules.h. Definition at line 668 of file modules.h. Definition at line 921 of file modules.h. Reimplemented in CSSet, MChanstats, ChanServCore, OSDefcon, BotServCore, IRC2SQL, and HelpChannel. Definition at line 893 of file modules.h. Reimplemented in CSSet, ProtoInspIRCd20, MChanstats, OSDefcon, and IRC2SQL. Definition at line 902 of file modules.h. Called when a channel is synced. Channels are synced after a sjoin is finished processing for a newly created channel to set the correct modes, topic, set. Reimplemented in ProtoUnreal, CSSet, ProtoInspIRCd20, OSDefcon, ProtoCharybdis, ChanServCore, and CSTopic. Definition at line 1016 of file modules.h. Reimplemented in ProtoUnreal, CSMode, ProtoInspIRCd20, MChanstats, ChanServCore, CSLog, and BSAutoAssign. Definition at line 637 of file modules.h. Definition at line 642 of file modules.h. Definition at line 647 of file modules.h. u The user trying to identify, if applicable. Reimplemented in EBCRYPT, EMD5, ESHA256, NSIdentifyLDAP, ESHA1, ModuleSQLAuthentication, EOld, and ENone. Definition at line 831 of file modules.h. Reimplemented in CSSet, and ChanServCore. Definition at line 1065 of file modules.h. Reimplemented in CSSet, CSAKick, OSForbid, CSSuspend, and OperServCore. Definition at line 692 of file modules.h. Called when a channels modes are being checked to see if they are allowed, mostly to ensure mlock/+r are set. Reimplemented in CSMode, and ChanServCore. Definition at line 1009 of file modules.h. Checks if access has the channel privilege 'priv'. Definition at line 707 of file modules.h. Definition at line 432 of file modules.h. Reimplemented in CSSet, CSAccess, ChanServCore, BotServCore, and MemoServCore. Definition at line 652 of file modules.h. Definition at line 391 of file modules.h. Definition at line 530 of file modules.h. Definition at line 433 of file modules.h. Reimplemented in ProtoUnreal, CSSet, ProtoInspIRCd20, MChanstats, and ChanServCore. Definition at line 657 of file modules.h. Reimplemented in MChanstats, NickServCore, ChanServCore, and LDAPOper. Definition at line 773 of file modules.h. Definition at line 859 of file modules.h. Definition at line 763 of file modules.h. Definition at line 557 of file modules.h. Called when a DNS request (question) is recieved. Definition at line 1003 of file modules.h. Reimplemented in EBCRYPT, EMD5, ESHA256, ESHA1, EOld, and ENone. Definition at line 390 of file modules.h. Definition at line 536 of file modules.h. Definition at line 542 of file modules.h. Called every options:expiretimeout seconds. Should be used to expire nicks, channels, etc. Reimplemented in OSSession, NickServCore, CSSeen, and ChanServCore. Definition at line 1070 of file modules.h. Reimplemented in NSCert, and IRC2SQL. Definition at line 842 of file modules.h. Definition at line 714 of file modules.h. Definition at line 854 of file modules.h. Called after a user joins a channel If this event triggers the user is allowed to be in the channel, and will not be kicked for restricted/akick/forbidden, etc. If you want to kick the user, use the CheckKick event instead. Reimplemented in CSSet, ChanServCore, CSSeen, CSEntryMessage, NSRecover, Greet, MemoServCore, IRC2SQL, and BotServCore. Definition at line 472 of file modules.h. Called when a user leaves a channel. From either parting, being kicked, or quitting/killed! Reimplemented in BotServCore, and IRC2SQL. Definition at line 463 of file modules.h. Definition at line 626 of file modules.h. Reimplemented in DBOld, DBFlatFile, DatabaseRedis, DBSQL, and DBMySQL. Definition at line 385 of file modules.h. Reimplemented in CSLog, ChanServCore, and OperServCore. Definition at line 989 of file modules.h. Definition at line 997 of file modules.h. Definition at line 884 of file modules.h. Definition at line 877 of file modules.h. Definition at line 1057 of file modules.h. EVENT_CONTINUE to let other modules decide, EVENT_STOP to deny the mlock. Reimplemented in ProtoUnreal, ProtoInspIRCd20, and ProtoCharybdis. Definition at line 933 of file modules.h. Definition at line 946 of file modules.h. Reimplemented in ModuleDNS, ModuleRedis, ModuleLDAP, and ModuleSQL. Definition at line 952 of file modules.h. Called when a new server connects to the network. Reimplemented in ModuleDNS, GlobalCore, and IRC2SQL. Definition at line 342 of file modules.h. Definition at line 790 of file modules.h. Definition at line 807 of file modules.h. Definition at line 784 of file modules.h. Definition at line 801 of file modules.h. Reimplemented in NickServCore, and MemoServCore. Definition at line 768 of file modules.h. Definition at line 720 of file modules.h. Definition at line 796 of file modules.h. Definition at line 813 of file modules.h. Definition at line 525 of file modules.h. Reimplemented in NickServCore, and HSGroup. Definition at line 726 of file modules.h. Reimplemented in NSRegister, NickServCore, NSIdentifyLDAP, MemoServCore, ModuleSQLOper, and LDAPOper. Definition at line 731 of file modules.h. Reimplemented in NSSet, NickServCore, MChanstats, NSList, OSInfo, NSSuspend, NSSetMisc, and Greet. Definition at line 821 of file modules.h. Definition at line 741 of file modules.h. Reimplemented in MChanstats, NSIdentifyLDAP, and NSAccess. Definition at line 748 of file modules.h. Definition at line 753 of file modules.h. Definition at line 758 of file modules.h. Reimplemented in NickServCore, MemoServCore, and HostServCore. Definition at line 836 of file modules.h. Called when a nick is validated. That is, to determine if a user is permissted to be on the given nick. Reimplemented in NSCert, and NSSuspend. Definition at line 1078 of file modules.h. Definition at line 456 of file modules.h. Called after a command has been executed. Definition at line 376 of file modules.h. Reimplemented in NickServCore, ChanServCore, MemoServCore, and BotServCore. Definition at line 361 of file modules.h. Definition at line 583 of file modules.h. Called before a bot is assigned to a channel. ci The channel the bot is to be assigned to. bi The bot being assigned. EVENT_CONTINUE to let other modules decide, EVENT_STOP to deny the assign. Definition at line 320 of file modules.h. Reimplemented in CSSet, and CSSuspend. Definition at line 485 of file modules.h. Called before a command is due to be executed. Reimplemented in NSSet, OSForbid, OSDefcon, NSIdentifyLDAP, ModuleSQLAuthentication, NSResetPass, and NSMaxEmail. Definition at line 369 of file modules.h. Reimplemented in NickServCore, OperServCore, ChanServCore, MemoServCore, BotServCore, GlobalCore, and HostServCore. Definition at line 355 of file modules.h. Reimplemented in NSSet, NSRegister, and NSSuspend. Definition at line 520 of file modules.h. Definition at line 448 of file modules.h. Reimplemented in GnuTLSModule, and SSLModule. Definition at line 494 of file modules.h. Definition at line 502 of file modules.h. Called before a user has been kicked from a channel. kickmsg The reason for the kick. Reimplemented in MChanstats, and CSSeen. Definition at line 297 of file modules.h. Definition at line 582 of file modules.h. Reimplemented in BSKick, MChanstats, and Fantasy. Definition at line 984 of file modules.h. Called when Services' configuration is being (re)loaded. A ConfigException to abort the config (re)loading process. Reimplemented in ProtoUnreal, CSSet, ModuleDNS, EBCRYPT, CSMode, ProtoInspIRCd20, CSAccess, ModuleDNS, OSSession, CSXOP, ModuleRedis, MChanstats, ModuleLDAP, CSFlags, OSNews, CSSeen, ProtoCharybdis, HTTPD, OSDefcon, GnuTLSModule, CSLog, NickServCore, ModuleProxyScan, NSSuspend, NSIdentifyLDAP, OperServCore, NSSetMisc, ModuleSQL, CSSetMisc, ModuleXMLRPC, DatabaseRedis, ModuleRewrite, DBSQL, MemoServCore, DBMySQL, SSLModule, ModuleSQLOper, HSGroup, CSTop, ModuleDNSBL, LDAPOper, ChanServCore, ModuleSQLAuthentication, ModuleSQLite, CSStats, IRC2SQL, GlobalCore, BotServCore, HostServCore, and SQLLog. Definition at line 312 of file modules.h. Reimplemented in DBFlatFile, DBSQL, NickServCore, DBMySQL, and GlobalCore. Definition at line 510 of file modules.h. Definition at line 380 of file modules.h. Reimplemented in DatabaseRedis, DBSQL, and DBMySQL. Definition at line 1028 of file modules.h. Definition at line 1029 of file modules.h. Reimplemented in DBMySQL, DatabaseRedis, and DBSQL. Definition at line 1030 of file modules.h. Definition at line 1027 of file modules.h. Reimplemented in DBFlatFile, DBSQL, and DatabaseRedis. Definition at line 1031 of file modules.h. Definition at line 498 of file modules.h. Definition at line 506 of file modules.h. Reimplemented in ModuleDNS, OperServCore, and IRC2SQL. Definition at line 568 of file modules.h. Definition at line 957 of file modules.h. setting The setting passed to the command. Probably ON/OFF. EVENT_ALLOW to bypass access checks, EVENT_STOP to halt immediately. Definition at line 1040 of file modules.h. Reimplemented in CSSet, NSSet, ChanServCore, and BotServCore. Definition at line 1025 of file modules.h. Definition at line 869 of file modules.h. Called when a nickserv/set command is used. Definition at line 1049 of file modules.h. Reimplemented in HSGroup, and HostServCore. Definition at line 864 of file modules.h. Reimplemented in DBFlatFile, DBSQL, NickServCore, DBMySQL, GlobalCore, and IRC2SQL. Definition at line 514 of file modules.h. Reimplemented in MChanstats, CSTopic, and IRC2SQL. Definition at line 479 of file modules.h. Definition at line 940 of file modules.h. Definition at line 962 of file modules.h. Definition at line 847 of file modules.h. Called when a new user connects to the network. Reimplemented in ModuleDNS, OSSession, OSDefcon, OSNews, OSForbid, CSSeen, NickServCore, ModuleProxyScan, OSStats, OperServCore, ModuleDNSBL, and IRC2SQL. Definition at line 337 of file modules.h. Called when a user has been kicked from a channel. Definition at line 306 of file modules.h. Reimplemented in NSSet, NSAJoin, NickServCore, IRC2SQL, and HostServCore. Definition at line 736 of file modules.h. Definition at line 926 of file modules.h. Reimplemented in NSSet, OSNews, NickServCore, OperServCore, OSNOOP, and IRC2SQL. Definition at line 909 of file modules.h. Reimplemented in NSSet, OperServCore, and IRC2SQL. Definition at line 916 of file modules.h. Reimplemented in ProtoInspIRCd12, ProtoUnreal, ProtoInspIRCd20, ProtongIRCd, ProtoHybrid, ProtoBahamut, OSForbid, CSSeen, NickServCore, OperServCore, NSRecover, and IRC2SQL. Definition at line 348 of file modules.h. Reimplemented in OSSession, NickServCore, CSSeen, and IRC2SQL. Definition at line 574 of file modules.h. Definition at line 99 of file module.cpp. Toggles the permanent flag on a module. If a module is permanent, then it may not be unloaded. Naturally, this setting should be used sparingly! state True if this module should be permanent, false else. Definition at line 84 of file module.cpp. Set the modules version info. Definition at line 94 of file module.cpp. Definition at line 245 of file modules.h. Referenced by CommandOSModInfo::Execute(), and SetAuthor(). Definition at line 237 of file modules.h. Referenced by CommandOSModInfo::Execute(), and Module(). Definition at line 229 of file modules.h. Referenced by ModuleManager::DeleteModule(), and ModuleManager::LoadModule(). Definition at line 233 of file modules.h. Referenced by ModuleManager::DeleteModule(), CommandOSModInfo::Execute(), CommandOSModReLoad::Execute(), CommandOSModUnLoad::Execute(), ModuleManager::LoadModule(), and Module(). Definition at line 221 of file modules.h. Referenced by Log::BuildPrefix(), ModuleManager::DeleteModule(), CommandOSModInfo::Execute(), CommandOSModReLoad::Execute(), CommandOSModList::Execute(), CommandOSModUnLoad::Execute(), ModuleManager::FindModule(), Configuration::Conf::GetModule(), Anope::Init(), Module(), HostServCore::OnReload(), GlobalCore::OnReload(), IRC2SQL::OnReload(), ChanServCore::OnReload(), MemoServCore::OnReload(), NickServCore::OnReload(), Anope::Process(), LogInfo::ProcessMessage(), Message::Privmsg::Run(), Message::Version::Run(), InspIRCd12Proto::SendBOB(), ModuleManager::UnloadAll(), and ~Module(). Definition at line 217 of file modules.h. Referenced by GetPermanent(), Module(), and SetPermanent(). Definition at line 225 of file modules.h. Referenced by CommandOSModReLoad::Execute(), CommandOSModList::Execute(), CommandOSModUnLoad::Execute(), ModuleManager::FindFirstOf(), Module(), and ModuleManager::UnloadAll(). Definition at line 241 of file modules.h. Referenced by CommandOSModInfo::Execute(), CommandOSModList::Execute(), and SetVersion().